Plumber was our first fully computer generated short film produced over a six month period at Redrover Animation Studios Ltd. in association with Bravo!Fact. It was directed by myself and Andy Knight and produced by Randi Yaffa. The concept initially began as a pitch for a grant from Bravo!Fact and, after a storyboard and animatic was created and submitted by Andy Knight, we were chosen as one of approximately 12 final contestants. With the grant officially awarded to us, we began production only one week after that in late August, 2002. The purpose of producing the film was to introduce Redrover into the short film production industry as well as to push the studios’ creative and technological experience to the limit. The film was completed in February 2003, making it a six month project from start to finish. Plumber has won various awards and screenings at numerous festivals including a nomination for “Best Animation” at the 2004 Orange British Academy Film Awards (BAFTA). For more info, please visit the Awards and Publications section. On a final note, I get asked regularly by plumbing companies if they can use this video on their website. Unfortunately, no. This video cannot be used for commercial purposes and the rights are licensed to a distribution company. I do not have the right to grant others permission to host or distribute this film. 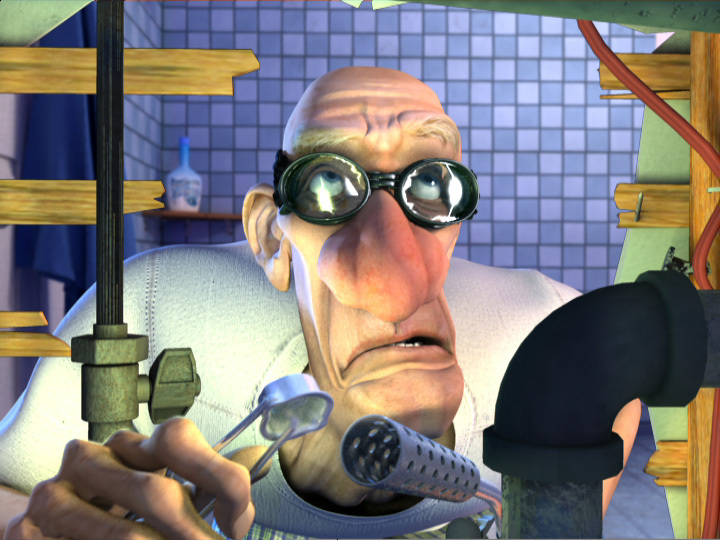 Plumber was actually quite groundbreaking at the time it was released due to the large number of fluid dynamic shots in the film and the use of global illumination rendering which was still in it’s infancy at the time, especially when it came to computer animation production. There is a really good write-up about the film with great detailed info on CG Society. 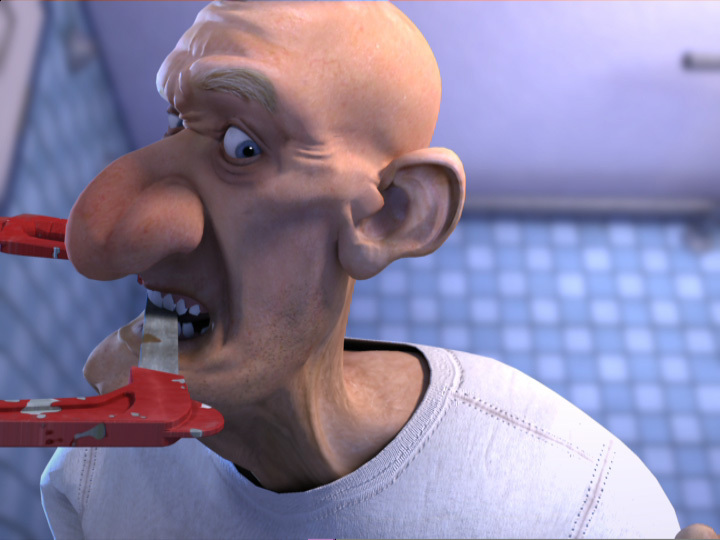 “Plumber” was created using Discreet’s 3dsmax 4.2 for all modeling, texturing and animation. Adobe Photoshop was used for texturing creation/editing, Chaos Group’s Simcloth for dynamic clothing, Next Limit’s RealFlow/RealWave for computational fluid dynamics, Chaotic Dimension’s VRay 1.09 for lighting and rendering, Discreet’s Combustion for compositing and Avid for editing. Plumber was rendered on 20-30 Intel machines rangine from dual P3’s to 2GHZ P4’s, each with 1GIG Ram over a duration of about 3 weeks to a month. Directors: Richard Rosenman, Andy Knight. Art Directors: Richard Rosenman, Andy Knight and Brad Husband. Modeling, Rigging and Cloth: Ben Pilgrim. Character Animation: Richard Rosenman and Kyle Dunlevy. Backgrounds and Props: Chris Crozier. Texturing, Lighting and Rendering: Richard Rosenman. Assisting Texture Artist: Raine Anderson.